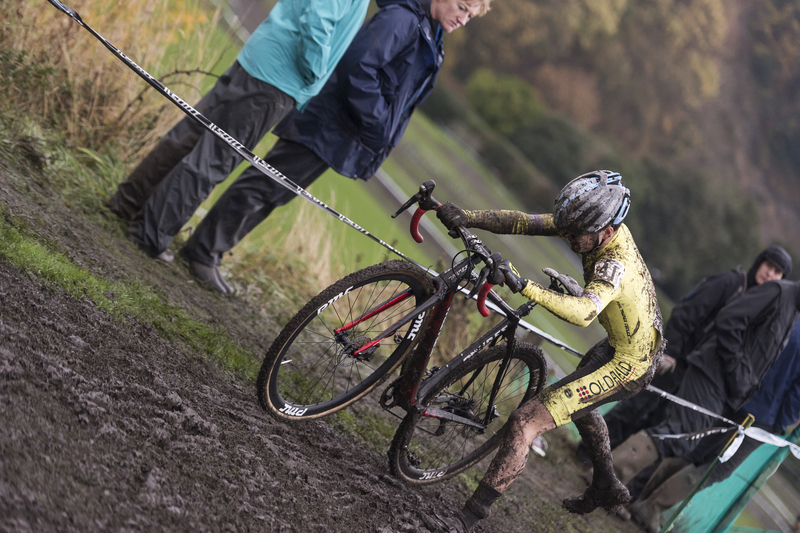 Ian Field made it three wins from three and Beth Crumpton took her first ever National Trophy win in round three of the 2015 edition of the British Cycling National Trophy Cyclo-cross Series held in Durham. 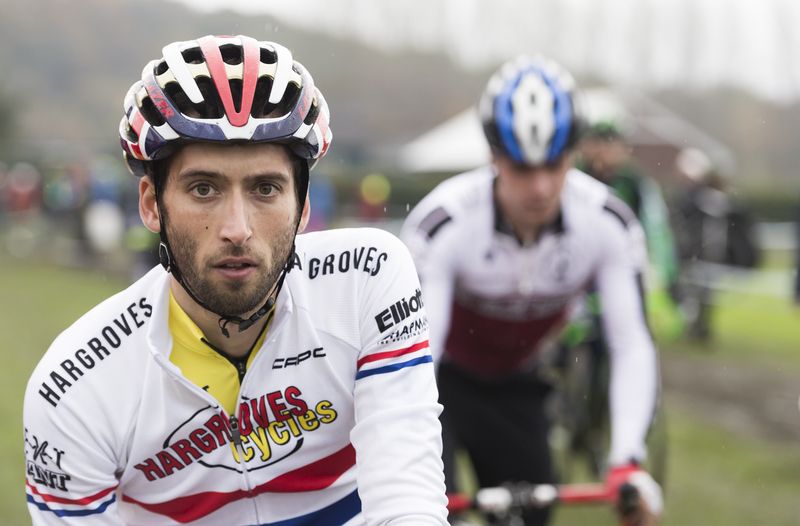 Ian Field (Hargroves Cycles-Ridley) took his third victory in the elite men’s race to extend his lead in the British Cycling National Trophy Series overall. The National Champion didn’t put a foot wrong once he had taken the lead from Ben Sumner (Beeline-Gener8) on the second lap. Sumner took the early lead on the opening circuit and along with Nick Barnes (Hargroves Cycles-Ridley) and Sleaford Wheelers’ George Thompson set a blistering pace on the challenging surface. Raleigh-GAC’s Steven Roach was sitting just behind the lead group and with Dave Fletcher (Pines-Felt-Envy), Field, Nick Craig (Scott Racing) and Hope Factory’s Jack Clarkson set off on the pursuit. The first real mud of the season was proving to be hard going, sucking the speed out of the legs, and many back markers were already finding themselves out of the race. The front of the race was also having its troubles, again the thick mud was making half lap bike changes a must as the pit crews proving their worth. The gaps were starting to appear well before mid-race. Field was now out alone and setting his own pace, while Sumner was starting to drop the early pace and Dave Fletcher and Steve Roach were working off the chase and were together across the top field. But as the race dropped to the river Fletcher made his move and attacked the Raleigh man, and soon had a clear gap between himself and Roach. Nick Craig looked to be revelling in the tough conditions and took the Fletcher move as a catalyst to attack the chase group. Sumner was heading backwards and Fletcher caught him as he hit the cricket field steps. Craig was working across to Roach and would soon pass him and then Sumner. As the race entered its last couple of laps the gap between Craig and Fletcher began to drop and Craig passed Fletcher as the race went across the bottom field. But Fletcher didn’t allow the gap to go and took the hurdles half a length behind the Scott rider. Leader Field had a big gap at this point, and the main race would be for second place. Sumner, Paul Oldham and Roach were still in contention for the a podium place but coming into the finish arena Oldham slipped his chain, allowing Sumner and Roach to scamper away. Giles Drake (Leisure Lakes) had worked well throughout the race and was sitting behind the chasers but the gap was to be too big to pull back. Field took the bell and looked to ease off slightly, but the battle for second was still between Fletcher and Craig, Fletcher having the legs to take the final run in ahead of Craig. Sumner held on to fourth and Roach took another top five place. “There was actually a fair bit of grip. It was getting claggy towards the end,” said Field. “Earlier on it wasn’t too bad but then we had some rain just before the end and it was just a slog all the way round. “At the end of the day, I’m a professional bike rider and winning this is more important than coming tenth at the European Championships where I wouldn’t get any prize money or real UCI points. It didn’t make sense to compromise this. 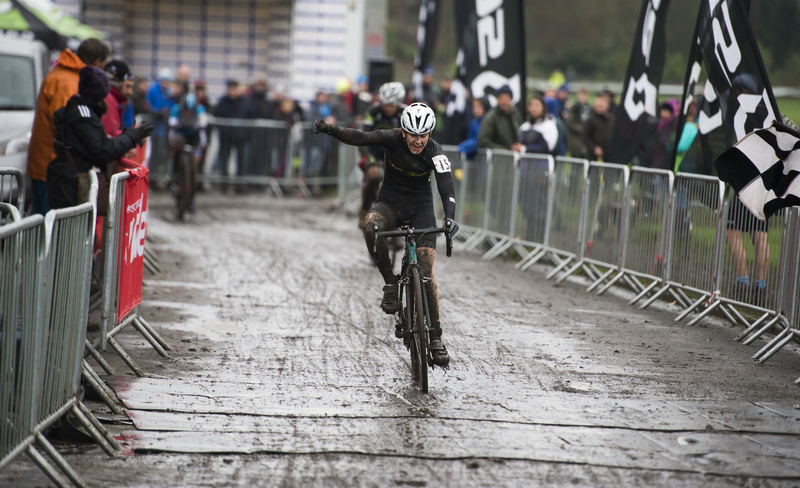 Beth Crumpton (North West CC) took victory in round three of the National Trophy, securing her first win in the Elite women’s race. Crumpton, who travelled through the night after competing in the European Championship the previous day, stole the race on the final lap from Amira Mellor (Oldfield/Paul Milnes Cycles) who had controlled the race from early on. Mellor - who also took the overnight trip - looked exhausted as she crossed the line, the trip perhaps having taken its toll. Series leader Hannah Payton (Kenesis UK), who was also in Holland the previous day, completed the podium in third but held on the leader’s yellow jersey. Both Crumpton and Mellor had a strong start, leading the race out around the cricket field and setting a fast pace on the slippy surface with both riders always doing well on a muddy course. Payton and Hope Factory’s Annie Simpson were a few bike lengths behind but the gap would soon increase. A returning Delia Beddis (Vicious Velo) also looked to be back to form and - along with Emily Wadsworth (Beeline Gener8) - occupied fifth and sixth. As the race completed the first lap Mellor passed Crumpton and sprinted away. Crumpton looked to be feeling the effects of a long weekend and couldn’t respond to the attack. Mellor, who took her first victory 12 months ago, looked to be on track to reproduce that win. Simpson and Payton were falling off the early pace and Payton - who crashed the day before - had no answer the two leaders. As the race progressed Mellor was off the front, the course looking to suit the 18-year-old, but Crumpton was beginning to find her lines and was still in sight of the leader. The gap to the remainder of the field was growing. Payton was safe in third place, consolidating her series lead while Wadsworth and Beddis were looking for a fourth place. The status quo remained the same until the final lap when Mellor took a final pit visit to change bikes while Crumpton took the chance to take the final half lap without a clean bike. Mellor came out of the pits level with her rival, but Crumpton had the momentum from the straight and took the lead back from Mellor, a lead and a first elite victory the she wasn’t going to relinquish. Speaking after her win, Beth said: “I travelled overnight so I wasn’t sure how the legs were going to feel today. I was quite happy to see it muddy because that slowed it down for me after yesterday’s really fast one. I was feeling a bit of tiredness in the first few laps. Tom Pidcock (Oldfield/Paul Milnes Cycles) took a fine win in the junior race at round three in Durham. The current Series leader - fresh from his eighth place at the European Championship the previous day - stole the show from team-mate Ben Turner and the early race leader Mark Donovan (Beacon Wheelers). It was Donovan and Josh Waters (Sherwood Pines) who took the race away from the start straight, Donovan heading up the race with a blistering pace taking the long line round the far end of the course. Pidcock and Turner were a little way back with Calum Fernie (Nottingham Clarion), George Fox (Paul Milnes Bradford), Tom Mein (Derwentside CC) and Harry Yates (Hargroves Cycles-Ridley) but it was Donovan who looked to have the legs on the rest of the field. Pidcock chipped away at the leader as the race progressed and the hard work paid off, catching him mid-race and riding past, the Beacon rider unable to respond to the attack. Pidcock was away and able to ride his own race, taking the chequered flag some 40 seconds ahead of Turner who passed the Donovan in the final run in to the finish straight. Rob Jebb (Hope Factory Racing) added to his win at Derby with victory in the opening race of the day for over-40 veterans. Darren Atkins (Ride Coventry) held onto his Series lead taking second ahead of Jim Bryan(Zepnat RT). Atkins took the early lead, the yellow jersey heading the race up on the opening lap with Ian Taylor (C and N Cycles), Rob Thackray (Oldfield/Paul Milnes Cycles), Andy Peace (Jedi Cycles) and Keith Murray (Scott Racing) in the mix chasing for the lead. Jebb was working through the field and would soon be up with Atkins, the two pushing the pace up and getting a gap that no one could pull back. Jebb worked over Atkins and increased his lead as the lap board counted down. Atkins, although he had Jebb in his sights, couldn’t bridge the gap and had to be content with second. A late charge by Jim Bryan saw him overtake Ian Taylor to claim third by a handful of seconds. Keith Murray took a fine fifth on his home course. In the over 50s it was Tim Gould (Zepnat RT) who took his first win of the Series. With Series leader Chris Young missing the start, Gould made the most of his absence to take the win and the Series lead, but by his own admission he would have wanted Young in the race. Phil Roach (Team Jewson) took second after taking an early lead but relinquishing it to Gould mid-race. Roach couldn’t find the legs to get back on to Gould who gets quicker as the laps fall. Another strong ride by Sunset Cycle’s Grant Johnson claimed third. Darren Atkins, who finished second in the veteran 40 race said: “To be honest I’m really happy to still be in yellow. It’s not my sort of course or conditions or anything. It gives me less pressure going into the next round in yellow but we’ll see what the next few rounds are like. “Rob’s not running away with it as in distance, he’s not sticking loads of time into me and I’m not sticking loads of time into Jim. It’s still close, anything’s doable. Zepnat’s Tim Gould won the veteran 50 event and said: “With Chris Young not being here, obviously you can only beat the opposition and I had to try to beat Phil Roach. “Phil was going well today, but who knows how Chris would have done. I’d have liked to have beaten Chris to have really felt like I’d won my first one. Nottingham Clarion’s Poppy Wildman made it three out of three in the Under 16 girls race. Wildman once again proved too strong for the rest of the field, jumping away early on the first lap to take a lead she kept to the chequered flag. Fiona Turnbull (Speedflex RT) took second place after a race long battle with Welwyn Wheeler’s Elspeth Grace. Maddie Wadsworth (Beeline Bikes) took the win and the Series leader’s white jersey in the Under 14 girls race. Ava Oxley-Szilagyi (PH-MAS VCUK) took second after working through the field. With an early Wadsworth duo of Maddie and Anna heading up the race on the opening lap it did look as though there would be a repeat result of Derby but Edinburgh RC’s Anna Flynn and Sarah Briggs (Matlock CC) had other ideas, working through to second and third early on, but it was Oxley-Szilagyi who found the legs to take second place as the race progressed. Flynn held onto third and Anna Wadsworth took fourth ahead of Briggs. Euan Cameron (Paul Milnes/Bradford Olympic) took the win and his first victory for his new team in the Under 16 boys race while Lichfield’s Lewis Askey took the Series lead. Cameron proved too fast for the chasing Lichfield pair of Askey and Toby Barnes who took second and third respectively. Charlie Craig (Scott Racing) took his best 2015 Series result with fourth while Solomon Kerfoot Robson (Marsh Tracks) took fifth, the pair unable to hook up to the lead three. Emile Alexander (Lichfield City CC) took the win in the Under 14s boys race after a hard fought tussle with Beacon Wheeler’s Matti Egglestone. Alec Gregory (Leicester RC) took another podium place with third and claimed the Series lead in the process. Series leader Ben Tulett didn’t start after breaking his arm. Maddie Smith (Bolsover and District CC) took the win and retained the Series lead in the veteran women’s race. Alison Kinloch (PH-MAS VCUK) took second, unable to make inroads after a strong start from Smith. Bev Martin (Adept Precision RT) took third.